Jessica Kaknevicius, left, and Lacey Rose are the women behind Women in Wood, a networking group for women in the forest industry. Last year was a monumental one for women around the world. It is becoming apparent that women play a pivotal role in all industries, and that equitable opportunities for women are needed for industries to succeed. This year marks the fourth year since Women in Wood (WIW) first launched – a networking group focused on bringing together women who work in, with and for the woods. By sharing information, collaborating, networking and mentoring, the group has enabled women to help each other succeed. The most rewarding part of watching WIW grow has been how it has become a community that runs itself. The Facebook group has surpassed 800 members from around the world, and has remained private to women working in or thinking about exploring a career in the forest sector. The value of this group is immeasurable. Conversations include asking and receiving help with a job search; sharing stories of what inspired them to get into forestry; celebrating each other’s success; even field gear tips and tricks. It’s encouraging to see how many women offer advice, humour and experiences. One of the most memorable discussions in the last few months rose from a question about working solo in bear country, asking ‘How do you overcome that anxiety?’ The post generated almost 30 responses from women with tips and encouraging words. The Woman in Wood who asked the question, seven months into her career, responded with thanks saying that there was a lot of comfort in knowing she is not the only one to feel this way, and that she wasn’t going to give up. How many women before her have called it quits because they didn’t have anyone to discuss with? Last year, during National Forest Week, we encouraged women across Canada to host a meet-up through the wonders of social media. WIW rose to the task across Canada with seven events that brought together women in Ontario, Saskatchewan and B.C. Attendees had the opportunity to meet new people working in their areas and make valuable mentoring connections. We hope to see even more get-togethers this year. In May 2018, with the support of EACOM and the Ontario Professional Foresters Association (OPFA) conference committee, Women in Wood hosted a fireside chat and networking event. The fireside chat panel discussion featured Faye Johnson, RPF, director of forest tenure and economics branch at OMNRF (since retired), Jenny Tallman, RPF, chief forester at EACOM, and Beth McNeil, assistant deputy minister for the Canadian Forest Service. The room was packed, and the event was livestreamed on the WIW Facebook group. The honest and candid discussions were a highlight of the conference for attendees, providing insight for both men and women in the audience. The most powerful feedback came after the event, when we found out that the sound technician’s teenage daughter, who happened to be helping him out, reached out to members of the EACOM community inquiring about a career in forestry. 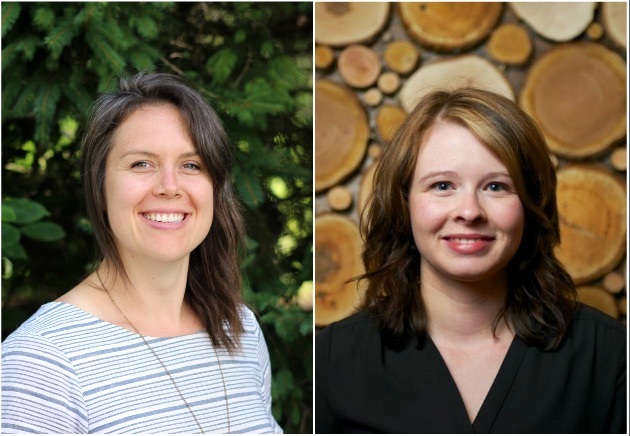 The WIW Blog has hosted some heavy-hitters in the forest community in the past year (including the first woman to become a registered professional forester in Ontario), and we encourage you to catch up online. If you have a story to share, connect with us – we are always look for new blog posts to feature the diversity of Women in Wood. We are also encouraged to see that many conversations and initiatives have kicked off aimed at reducing the gender equity gap and increasing opportunities for women in our sector. Tolko has launched a Women in the Workplace Strategy. Irving is featuring women in their workforce. EACOM has been endlessly supportive of WIW, and has a growing number of women in leadership roles who have contributed to the group. And the Canadian Institute of Forestry recently announced an initiative to promote gender equity in Canada’s forest sector – an exciting collaboration of industry, Indigenous groups, non-profits, academia and government. The future looks bright. When we first started this journey together, as a simple networking group, we didn’t know how big the need was. We’ve since learned that there is still work to be done to get more women in the woods, but are encouraged by how many have stepped up to the plate. We’re looking forward to what’s to come. Lacey Rose, RPF, and Jessica Kaknevicius, MFC, are the women behind www.womeninwood.ca.